Night sky photographer Victor Rogus captured this image of the first quarter moon plus two seconds from Jadwin, Mo. on Jan. 18, 2012. He used a Cannon 60Da camera with a Losmandy G-8 mount, 5 inch Apochromatic refractor, exposure of 1/15 second, ISO 100 and a Baader polarizing filter to take the image. 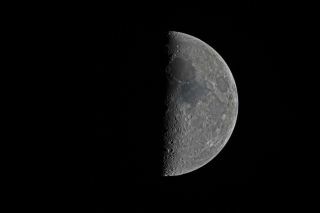 Demonstrating the importance of a carefully-timed photo, one night sky photographer captured a stunning image of the first quarter moon plus two seconds. Victor Rogus of Jadwin, Mo., snapped this shot of the moon in a wintery Jan. 18 night sky. "A bit cold and windy here in Jadwin, Missouri, but timing is everything isn't it?" Rogus told SPACE.com via email. Rogus used a Cannon 60Da camera with a Losmandy G-8 mount, 5 inch Apochromatic refractor, exposure of 1/15 second, ISO 100 and a Baader polarizing filter to take the image. The January full moon, or Full Wolf Moon, occurred on Jan. 26 and is so named because Native American lore states this is the month when wolf packs can be heard howling together. Sometimes it was also referred to as the Old Moon, or the Moon After Yule.